Hand made gift wrap using re-purposed paper. 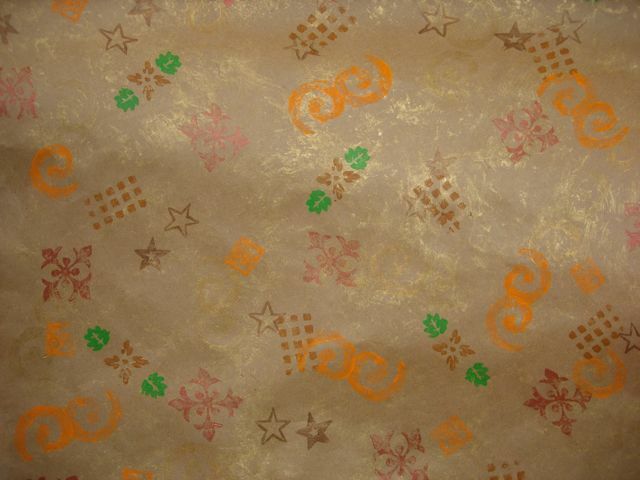 FREE hand made gift wrap with your purchase today only! Many of the stamps used in creating this paper are also hand made by me. Some of the stamps are made of flip flop bottoms. Pretty metallic paints, very festive. We have a lot of nice personal items in stock and it is probably time for you to treat yourself! Come by the gallery today or contact me with your selections for shipping. Mele Kalikimaka! Merry Christmas! Be merry and bright. Peace. Love. 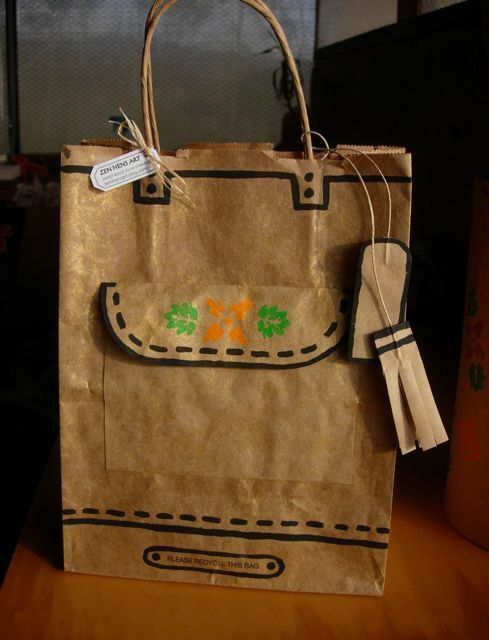 Hand made using re-purposed brown bag. A miniature really pops when I find the exact right features to exaggerate. That’s why I’m gone a little crazy over this eyelash yarn which was given to me and which has sparked a creative surge. I’m finding a variety of fancy furry and fuzzy effects, depending on how the yarn is used. The solid color turtlenecks are ready for their big embellishments, but for now I am just enjoying the basic simplicity of a well shaped piece. The difference between an okay turtleneck and a perfect one, is a matter of only two stitches at each shoulder being changed from single to double crochet. Tiny sweater ornaments embody a fashion-forward consciousness with an emphasis on fun and whimsy. Please enjoy the slideshow of tiny sweater ornaments and let me know what you think. Most of these are still available or can be special ordered. 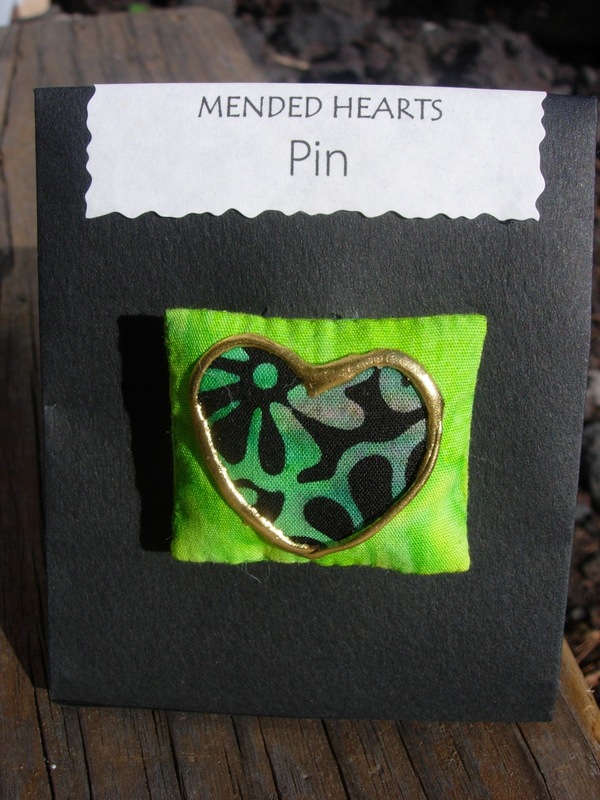 Contact me through the contact page, our Etsy store, or facebook page. Stay warm. Aloha and mahalo! 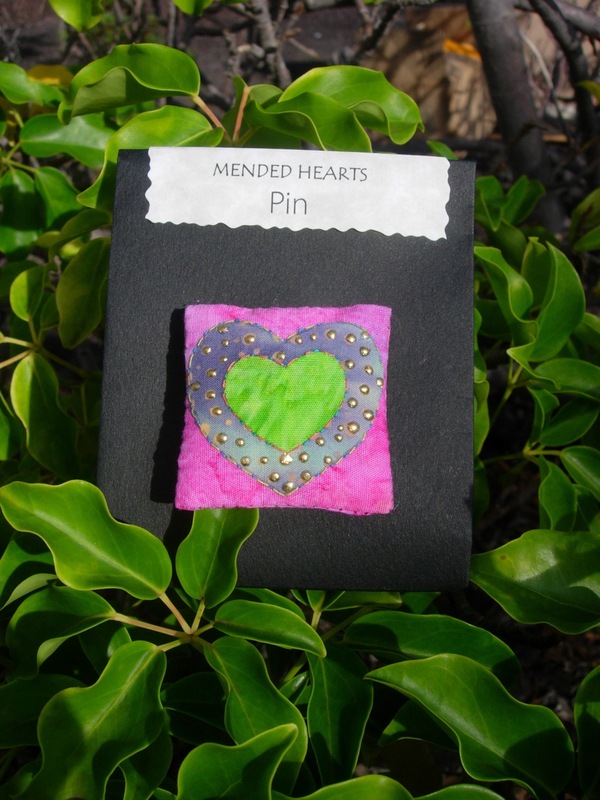 I’m ecstatic about these new Mended Hearts pins by Charlene. Exactly the right amount of plush and square and perfectly delightful. Because they are soft in front, you can wear them and still go around hugging people! Come by the gallery to purchase or contact me. Aloha! Having fun today decorating the gallery. The Aloha sweaters are officially here. I have sold out of sweater ornaments as of this evening. Please contact me if you would like to discuss a special order. Thank you! A beautiful little wallet for a Lady who likes to travel light. The “Maya” wallet features a lined and zippered coin section, four card holding sections and a place for your folding money. And, as you may discover with glee, there’s another small pocket behind the coin section. This is your special secret pocket, I don’t know what you’ll use it for. Happily, I’ve decided I like the zig zag edge lots better than a bias tape binding. Less struggle to work it — with more cohesion in the hand. Twice around will do, but it takes three times around on my smallest zig zag stitch to get the silky look that I’m loving right now. The outside of the “Maya” is usually a Hawaiian print or batik, and quilted in a diamond shape. The edge is sewn in a close zig zag stitch, giving it a silky look that is both casual and finished. Inside I usually go for a whimsical motif. Secured with a velcro closure tab that has plenty of sturdy velcro. Nice rounded corners. Simply pretty. I’ve had good feedback on this product so far. I’m offering the “Maya” wallet as a SPECIAL ORDER ITEM, and the four separate wallets pictured below, while they last. All of my purse and wallet designs are named after the granddaughters of my special friends. This one was named for, and inspired by, a tiny tot. I understand she loves her zippers and so do I. So do I. Please contact me if you would like a joyfully custom-made “Maya” wallet of your own, or to check on the availability of the examples shown below. I’ve highlighted each of the four new wallets in its own slide show. Come by the gallery to purchase, visit our Etsy store, or contact me through the “Contact” page above, or through our facebook page. Aloha and mahalo! Little Caroline Totes, all in a row. The Caroline Tote has a retro vibe and a fully modern functionality. Designed with grown-up ladies in mind, it is a miniature handbag that has also been a favorite of small humans such as granddaughters and nieces. A perfect little vacation bag even if you normally carry a large bag at home. I pick out the fabrics that make me think of slack key guitars and drinks with paper umbrellas. Visit the New fashion accessories section of our etsy store for more pictures of the front, back and inside, and more details on each bag. The tote is fully lined and interfaced, with the essential features you need. A zipper pocket for your cards and cash. An open pocket for keys. The main compartment for a phone and lip balm, maybe your tourist-y map. Short handles fit comfortably in your hand for swinging down the street, or dangle them over your wrist, so cute! The shape, trim, and button flap, remind me of a wicker picnic basket on its way to the beach. And the Caroline Tote always features an over-sized button, more for humor than security. All of my handbag designs are named after special friends’ granddaughters. The Caroline Tote is definitely charmed. Thank you, Caroline. View the slideshow above for closeups of the new bags (and a trout bag) and then head over to our etsy store for more pictures of the front, back and inside, and more details on each bag, in the new fashion accessories section. Today I’m featuring the Mysterious Poetry series. 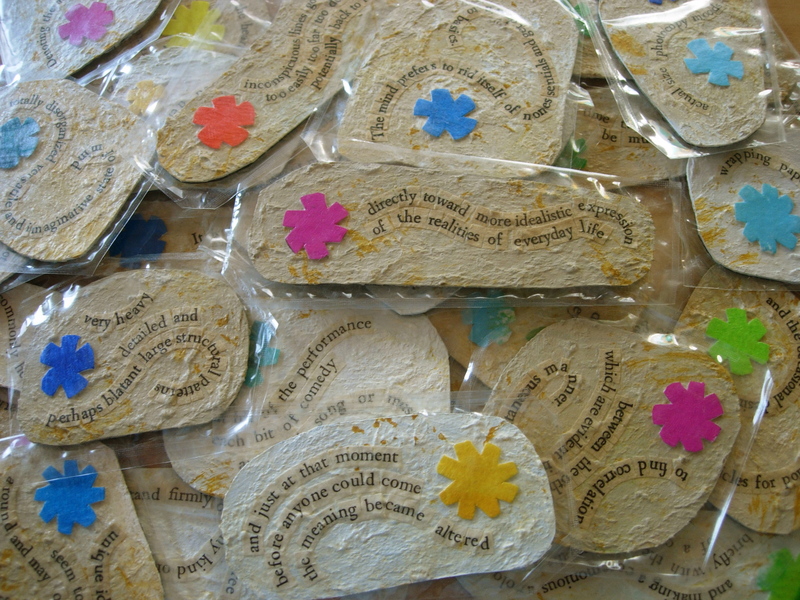 It comes in magnets, bookmarks, greeting cards, and earrings. Each piece very close to my heart, a tiny original artwork to provoke your thoughts. Fits your quirky sense of humor. Whole days could go by while I snip lines from books and shuffle them around until they make me laugh. Often they strike a poignant chord as well. Some of the poems make perfect sense and others remain mysterious. 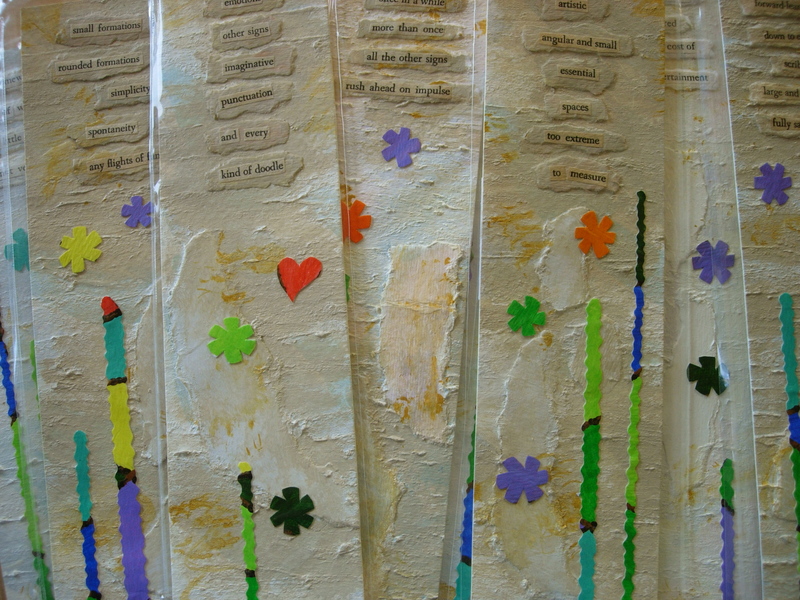 The poems are glued to paper on which I have added some layers of rough texture with a stucco-like feel. I sometimes curve the lines using old-time skills I gained as a paste-up artist in the 1980s. The background is painted with acrylic including sponged accents. Some feature the addition of asterisks, hearts or flowers that I’ve painted and cut out with a knife. The cards [not shown] are geared towards occasions and come in 3.5×5 and 5×7 inches. 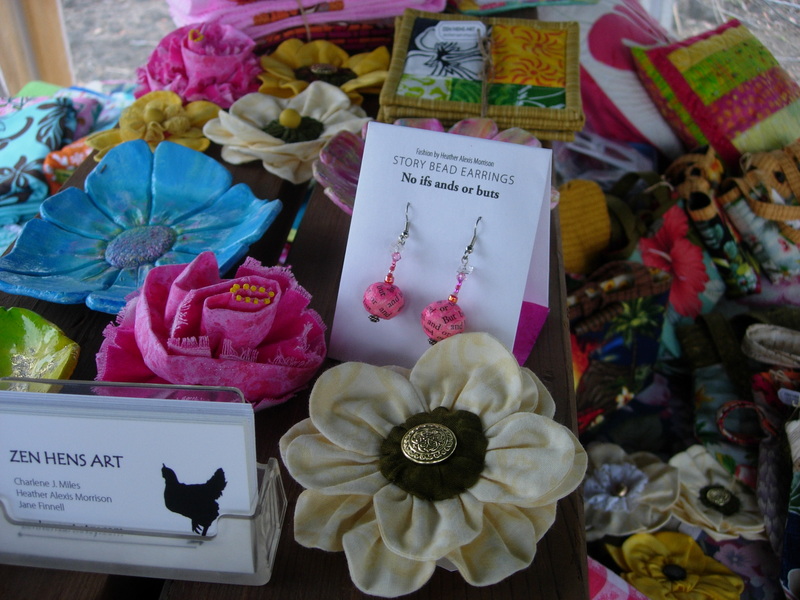 The earrings are hand-made papier mache beads, some have complete novellas that you can read (possibly with a magnifying glass). And I still have two or three pairs of the classic story that just says “No if and or but” over and over. Cracks me up every time.